Buena Parks pools and park programs offer fun ways to cool down while the weather heats up this summer. Join us for recreational swimming, swimming lessons, parents night out, free drop-in programs and so much more! Pools: Peak Park Pool, 7225 El Dorado Dr., Boisseranc Mini Pool, 7520 Dale St. and Brenner Park Wading Pool, 7373 San Rafael open Memorial Day, May 29 through Labor Day, September 4. Download the Aquatics 2017 flyer for more information! FREE recreational swimming on Memorial Day, May 29! Recreational swimming sessions throughout the day Monday-Sunday. Admission is $1.50 for adults and $1.00 for children. Free admission for parents with children 6 & under at Brenner Park Wading Pool Monday-Friday 1:00 4:00 p.m.
Water Polo, Aquaerobics and lessons for the hearing impaired may be offered, depending on interest. Parks: Park and playground programs offer fun open to the public. Free drop-in park programs offered Monday through Friday, 12:00-4:00 p.m. at Smith-Murphy Park, George Bellis Park, Carl Brenner Park, William Peak Park, Boisseranc Park, San Marino Park, Larwin Park and Ehlers Event Center. Parents Night Out are held Friday evenings 5:30-9:30 p.m. for $10.00 per child at Ehlers Event Center. Children participate in themed nights of fun and games with dinner and snacks provided. 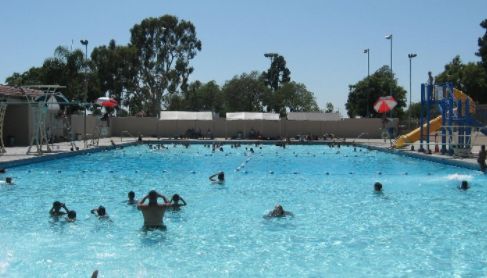 Special Park Happening Days Picassos in the Park, June 22; Wack-O-lympics, July 6; The Great Splash, August 3 all begin at 12:00 p.m.
Get outside for some summer fun at Buena Parks pools and parks! For more information, call (714) 562 3860.